SafanDarley’s new generation of E-Brake adds important new advantages to the E-Brake technology, which has already proven itself all over the world. The electric press brakes in the 50T–130T range are built according to a modular concept that is a new step forward in the efficiency of machine construction. The CNC crowning and the dual screen EC20 control are important characteristics. The new SafanDarley E-Brake Ultra has been further optimized in order to profit from the acceleration options and the other convenient servo characteristics. This not only makes the E-Brake very fast in rapid traverse, but also during the full cycle. Cycle times are also far shorter than with conventional electric press brakes as a result of the fast backgauge. 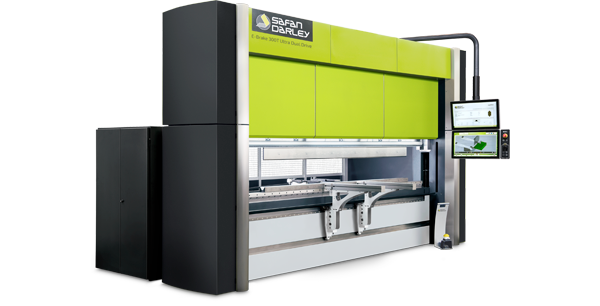 The SafanDarley E-Brake is shown to be up to 30% faster than conventional press brakes in comparative tests. Solidly constructed backgauge (system) with special spring stops that operates across the full working width.